Sure, it would be great to get magazine feature writers to interview you and run your life story in print. But if that goal is slow in coming, don’t give up. Do it yourself. Imagine your ideal interview. What questions would you like the interviewer to ask you? What sort of fascinating answers would you provide to amaze and inspire readers? Have some fun thinking this through. Next, write out your fantasy questions and answers. But don't ramble about everything under the sun. Stay focused on your musical identity and why people should care about you and your songs. Make your responses lively, interesting, and maybe even a little shocking and controversial. Take this self-produced Q&A and put it in your press kit and on your web site, or use it as a stand-alone item sent to the media. Journalists will use it to learn more about the artist behind the music, and they may very well use your quotes in the articles they write about you. Check out the amazing things people are saying about the ideas in this book. This is a great tip. As a journalist and an aspiring music blogger, I am starting to compile and write feature articles about unknown artists that catch my eye. Information and press kits like you mentioned would definitely make an impact on the decision to feature any particular artist. Having also worked in PR, creating quotes that capture exactly what you want to portray is an excellent way to help make the writer's article focus on the same things you want to emphasize. I've just recently stumbled onto your blog but I've enjoyed it even from a simple journalist's perspective of the artists she hopes to be able to feature and ultimately promote. Any artists looking for some extra exposure can contact me about an article to go on my site to be launched within the next couple months. Thanx for the tip. I recently stumbled on to your blog, but found this post to be very helpful. I think I will start asking myself some questions in my journals to at least get practice focusing my ideas into answers. Great post! 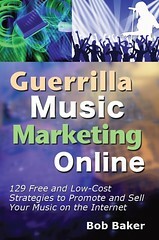 I'm currently taking the class, "Marketing & Management In The Music Industry" at my college. We just started discussing press kits and the importance of keeping information focused yet interesting at the same time. Generally readers don't get much further then the first paragraph so you need to make sure their attention has already been captured by the opening headline. Different subcultures and niches are always popping up so it is really important to establish a clear identity for yourself in the music world.